It’s a crew of delivery guys which have become an extremely common site in big Chinese cities. 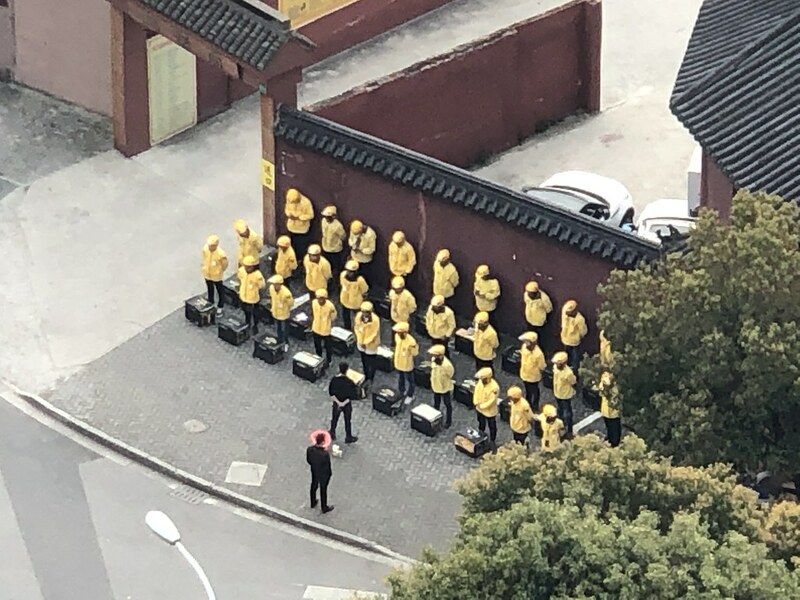 The yellow uniforms belong to 美团 (Meituan), while the chief competitor, 饿了么 (Ele.me) decks its delivery guys out in light blue. I’m no expert, but I would assume they do these daily morning meetings as the only time these “co-workers” are even together in the same place. The rest of the day they’re on and off their scooters all over the city, speeding from restaurant, to home, to restaurant, to home…. In-Group: I used to (still kinda do) that this looks very military and oppressive-like. It’s a lineup that almost all the waitstaff here do before a shift, students in school do it, property agents do it, and maybe only mid-level and upper management jobs don’t. However, I’ve been reading a book called “Outliers” and it describes how in India, there are these guys that deliver homemade lunches from a home to the office, everyday, and they have a mis-delivery or late delivery rate of something crazy like 1: 10,000, without an app, GPS, or AI! They use a simple code system to sort and get the box lunches to the right delivery guy at the right station, at the right time, every time. And yet, they aren’t all bitter, unhappy, or stressed out like the folks in Amazon warehouses these days. All this because they feel a part of a “group” (all from a similar hometown region), where they share a “uniform” (a special kind of hat), a “language” (local dialect), and a common purpose (money, and getting a homemade meal to family members). Similarly, I see these Meituan guys (mostly guys) driving three together on their scooters, taking breaks together, and all in all getting the job done. Importantly, they also having “meaning” in their work, which is the harder and better they work, the more money they earn. It may not be IPO, or huge bonus money, but it is important, meaningful and so ultimately, good honest work. So that’s how I saw and interpreted this photo today. Wishing those guys all the success in the world. Nice! I appreciate you sharing those thoughts. My thoughts are fairly similar… it seems a little authoritarian, but on the other hand, it’s good to have some kind of group cohesion.